Not using progress invoices? Maybe you should be. The U.S. economy may be picking up, but your customers are probably still being very careful with expenditures. If your company’s finances will allow it, you can help them out on sizable jobs by using progress invoicing, also known as partial billing or progress billing. You could, of course, simply create invoices for smaller chunks of the job as they come. A smarter way is build estimates for the entire job or sequential phases so your customer can see the big picture. You can still use progress invoicing to start collecting funds one segment at a time. First, be sure you have progress invoicing turned on. Go to Edit | Preferences | Jobs & Estimates | Company Preferences and make sure the Yes button is filled in next to the questions about estimates and progress invoicing. Figure 1: You can decide how many of your estimate items will be included on your progress invoice. By clicking one of these buttons, you can bill the customer 100 percent of what’s due on the invoice or just a percentage. But let’s say you and your customer have agreed that payment will be due in pre-defined states, so click the third button and select one or more of the line items. Click OK. QuickBooks will display a new window that lets you select items and/or percentages of amounts due. Figure 2: You can select specific items or percentages for you progress invoice. Click OK. QuickBooks will return to your progress invoice, which you can save and print or email to your customer. Your original estimate will remain unchanged. Tip: If you don’t want any of the zero amounts to appear on the progress invoice, go to Edit |Preferences | Jobs & Estimates | Company Preferences and make sure there’s a check mark in the box next to Don’t print items that have zero amount. When you want to bill for another set of items on this estimate, simply repeat these steps. Here’s an easy way to determine how much (if any) of the estimate has been invoiced. Go to the Customer Center and select the customer. Click the arrow next to the Show field and selectEstimates. Any estimate that has a zero in the OPEN BALANCE column has been completely billed. Figure 3: You can see what percentage of each estimate has been included on a progress invoice in this report. What if you determined that you won’t have one or more of the items on the estimate? 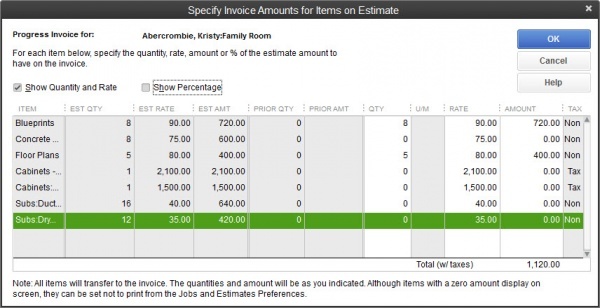 QuickBooks lets you quickly generate a purchase order. With your estimate open, click Create Purchase Order to select the item(s) needed and generate the form. You can also click Create Sales Order if one is necessary. Estimates provide a useful way to fine-tune your bookkeeping and inform your customers about impending costs. They can also be confusing if you don’t keep up with them. We can help you determine when they’re a good idea and how to keep them organized. QuickBooks provides good tools here, but they require some administrative control. But be sure that you’ve established all the right settings and understand the process. 1. First, be sure your are creating standard checks, not paychecks. Go to Banking | Write Checksor click the Write Checks icon on the home page. 2. QuickBooks offers a few option for check creation. Click Edit | Preferences | Checking | My Preferences. 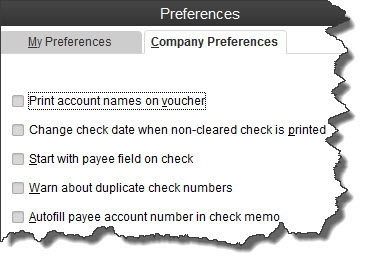 Here, you can specify a default account for the Write Checks function. ClickCompany Preferences for additional option. Figure 2: Check the boxes here to activate options. Check/PayCheck. Specify printer options and check style, change the fonts in some fields, designate a partial page printing style (using the envelope feed) and add your company’s name and address, logo and signature image. 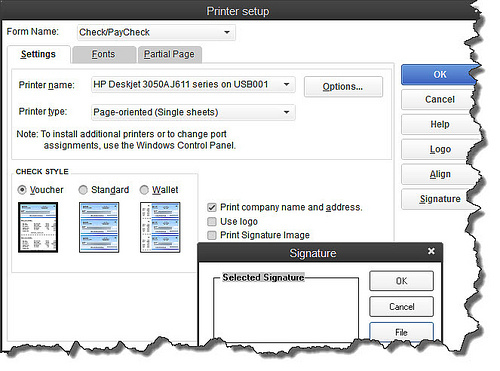 Figure 3: The Printer Setup window provides access to your output options. 4. Be sure that your printer has enough ink or toner before you begin a job. 5. If you print a lot of checks, consider dedicating one printer to that task. But secure your blank checks. Don’t leave them in the printer. Modify your printer’s property settings in Windows and/or consult your printer documentation. Figure 4: Uncheck any items you don’t want printed to remove them from the batch job. 8. Printing a batch of checks and realize that you’ve set something up wrong? Hit the Esc key to halt it. 9. Double-check to make sure that your numbers match before you launch a print job. 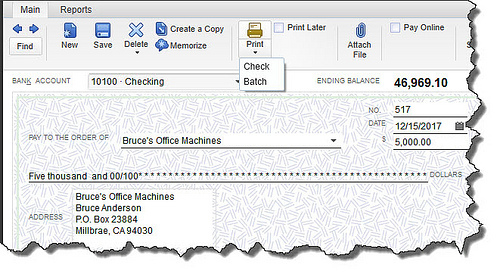 Compare the number in the First Check Number field to the number of the first check queued up in the printer. 10. Ruin a check or an entire page of them? If you accounting protocol allows you to skip check numbers, just start over by changing the First Check Number so that it corresponds with the starting number on a fresh batch of check blanks. If not, you’ll have to create a check for each one that was ruined, choosing a name and account and an amount of $0.00. Then void the check(s). (Click Banking | Use Register and select the account. Highlights the transaction(s), select the edit option and void. Do not delete them. Check-printing can be tricky, but it must absolutely follow the rules. Let us know if you get stuck or want some guidance upfront — or if you want to switch to online banking and bill-pay.